"To the theater to see a play!" What's better than that? 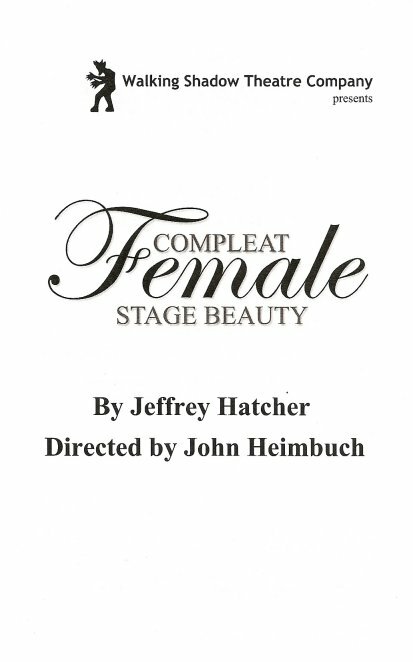 Compleat Female Stage Beauty is a play about theater, specifically about that time in the history of English theater when women were finally allowed to play female roles, taking over for the men who traditionally played female roles on the stage. 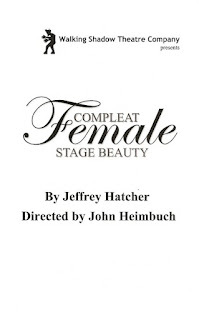 In this play by Jeffrey Hatcher, it's a difficult time of transition. It reminds me of that time in American film when "talkies" replaced silent films, and silent film actors had to figure out a place for themselves in the new era, or fade away (at least that's what I learned from The Artist). Similarly, the men, or in this case, one particular man, who had previously only played female roles, had to figure out a new place for himself in a world that has changed. The play is a fictionalized account based on the lives of several historical figures. Samuel Pepys kept a detailed diary of his life and the events in London in the 1660s, and serves as a sort of narrator, opening and closing the play (and uttering the above line several times). From what I can tell, he's a little like me - he enjoys going to the theater and writes everything down in his diary. If there were an internet in the 1600s, he probably would have had a blog too. :) The main character in the play is based on another historical figure, Edward Kynaston, one of the last male actors to play female roles on the English stage. When he finds out that "his" role of Desdemona in Othello is being played by a woman named Margaret Hughes (another historical figure) in a theater across town, he feels threatened. Eventually the king rules that men cannot play female roles on stage, and Kynaston's life falls apart. His lover leaves him, because he preferred to see him as a woman, as the role he was playing (as Rita Hayworth famously said, "Men fall in love with Gilda, but they wake up with me"). He takes a job singing bawdy songs in a pub, quite a step down from Shakespeare. It's there that his friend Maria finds him and, with the help of the King's mistress, gets him to return to the theater. He had always thought, "a man playing a man, where's the artistry in that?" But in teaching Margaret how to play Desdemona better than he ever did, he discovers a new love for the theater and a way to apply his artistry to male roles, the only ones open to him. As Maria says to him, "We are never suited for the roles we most desire." This is a great cast (most of whom were previously unknown to me), starting and ending with Wade A. Vaughn as Mr. Kynaston. He plays such a range of emotions (and costumes!) and does it all believably, emphatically, and sympathetically. He goes from an artist at the top of his game, to the object of mockery brought low, to a teacher and expert demanding respect. The play opens and closes with Desdemona's death scene, with Mr. K first as the murdered Desdemona and later as the murderer Othello, and I found myself wishing I could see the latter production. Jane Froiland (from last year's sublime Ten Thousand Things production of Doubt) is Mr. K's frenemy, the ambitious Ms. Hughes, who goes from merely a novelty to a good actress thanks to her association with him. Adelin Phelps is bubbly and entertaining as the boisterous comedic actress and mistress of the King. Matt Sciple as the scribe Pepys, Sean Byrd as the theater owner, and Teresa Marie Doran as the fresh-faced Maria are also wonderful in their roles, and along with the rest of the ensemble populate and bring to life this crazy aristocratic English Reformation society. The wigs, make-up, and costumes are quite astounding, and a lovely three-piece band accompanies the action with period music played on such instruments as the hammered dulcimer and melodica. All of which works to transport you back a few centuries.